The EON208P Personal PA System from JBL includes an eight-channel mixer and a pair of two-way loudspeakers which all clip together to form one portable unit. On the mixer itself, channels one through four feature bass, treble, reverb, and volume controls, as well as combo XLR-1/4" jacks. The first two channels provide phantom power—useful for condenser microphones—while channel three sports a Hi-Z input for guitars. Channels five through eight are grouped in stereo pairs, with the first two giving you RCA options, the second two giving you a 1/8" / 3.5mm stereo input for mp3 players and phones, and both sets offering dual 1/4" jacks as well. Additionally, this mixer can pair with Bluetooth devices for wireless streaming with tablets, smartphones, and other devices. 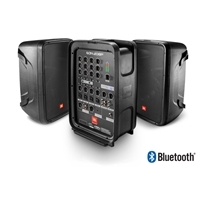 From small acoustic groups to DJ dance parties, you're ready to perform with the JBL EON208P portable PA. Four microphone/instrument inputs are available for musicians, each with their own Treble, Bass, and Reverb controls. Additional line inputs are available on 1/4", RCA, and 1/8" connectors, and there's a stereo output for adding a monitor speaker too. You can also stream audio from your mobile device via Bluetooth - perfect for backing tracks or break music. It's easy to dial in optimum sound with the JBL EON208P portable PA. An LED next to the main volume control shows you how close you are to maximum output power. To protect your speakers and ensure the best sound, a built-in DSP limiter will automatically tame harsh audio peaks. And because it's made by JBL, you can expect clear, detailed sound from the JBL EON208P at any volume level. You can carry your guitar and the JBL EON208P to the stage in just one trip. The EON208P sports a convenient carry handle, and the speakers attach to the mixer for a complete all-in-one solution. Setup is easy too - just put the speakers up on speaker poles, attach them to the mixer with speaker cables, and you're ready to perform!